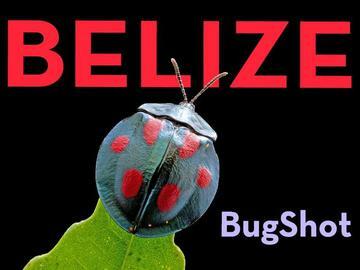 Join an all-star cast of professional photographers on an 8-day, 7-night tropical insect safari in Belize! Day 1. Attendees arrive at Caves Branch lodge from the Belize City airport (1.5 hour drive) in time for a late afternoon social and dinner. In the evening we introduce the workshop and blacklight for insects around the lodge. Day 2. We cover the basics of macrophotography equipment and lighting via hands-on practice in the botanical garden. In the afternoon, we hold an introduction to studio photography. An after-dinner presentation will introduce insect biology, after which we'll take a walk through the forest to spot katydids, net-casting spiders, army ants, stick insects, and other nocturnal animals. Day 3. We divide into smaller groups for trips away from the lodge. One group will visit Footprints cave to photograph amblypygids, cave crickets, and predaceous fungus gnats. The cave also holds Mayan relics. The second group will travel to Green Hills Butterfly Ranch to hone photo technique amid swirling clouds of domesticated butterflies, including longwings, glasswings, morphos, and swallowtails. In evening, we reunite for a tutorial on image processing & composition. As usual, the blacklight will be running to attract night-flying insects. Day 4. A morning visit to the Caves Branch River will supply us with aquatic insects, including diving beetles and dragonfly nymphs, to practice photographing in studio aquaria. After lunch we'll hear the instructors introduce the natural history of their favorite arthropod groups, followed by afternoon walks through the open habitats on Caves Branch's extended grounds. In the evening, we'll have a photo-sharing session followed by blacklighting. Day 5. The group that travelled to the cave on Day 3 will now visit the Butterfly ranch, and vice versa. In the evening, back at the lodge, we'll have a presentation on the science of rain forest ecology, followed by photo-sharing. Day 6 is unscheduled until dinner. During this free day you are welcome to sign up for one of Caves Branch's many adventure tours, visit Mayan ruins, continue shooting in the forest, or just lounge by the pool. The instructors will be on hand all day to offer one-on-one sessions. We'll have photo-sharing and a night walk after dinner. Day 7. We remain on Caves Branch trails to practice our photographic skills on fascinating subjects like orchid bees, dung beetles, and acacia-ants. The day also includes sessions on how to find and collect insects and an open Q & A discussion. We have a closing social event planned for the evening. Day 8. After breakfast and workshop closure we depart for the airport. Throughout the event, indoor insect studios and aquaria will be available for general use, and the blacklight/mercury vapor lamp will run every evening. Required Equipment: At a minimum you will need to bring a camera and lenses capable of close-in photographs, as well as an off-camera flash. We recommend an SLR camera with a 1:1 or greater macro lens. Alternately, suitable magnification is possible with a set of extension tubes, bellows, or a reverse-mounted lens kit. A point-and-shoot camera with a Raynox filter and a flash mount will also work. Price includes: All scheduled course activities, lodging, meals, and transportation to/from the airport. If you wish to bring a non-participating friend or spouse, they are welcome to stay at the lodge during the course pending availability. Contact Caves Branch for arrangements. Regstration by mail: Offline registrations are welcome! Contact Alex (alwild [at] myrmecos.net) ASAP to reserve your place manually and arrange alternative payment. Some attendees have reported trouble with PayPal during registration owing to the size of the transaction. If this happens to you, let Alex know ASAP. Your reservation will be kept while we sort out payment via other methods.